This is a simple flyer, 3 3/8" x 6" folded; I've reproduced the inside in larger scale at bottom since it has more fine detail. 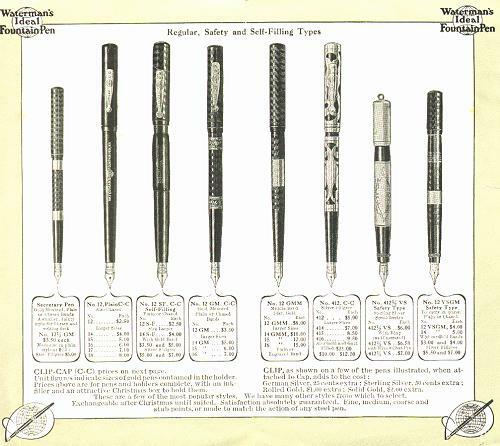 The flyer antedates 1915 (the year of introduction of Waterman's first lever-filler), and since clips are offered in "German silver", it is virtually certain that it predates the intense anti-German sentiment of WW1 (the material was thereafter known as "nickel silver"). Note that the line includes a self-filler: a sleeve-filler is third from the left. 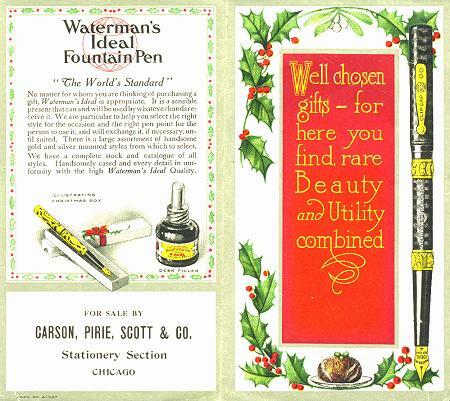 Sincere thanks to C. Gloeckner for making this bit of Waterman ephemera available to us all.